A small organic dairy farm in Hillside, NY, is the first to install the market’s latest solar thermal flat plate. 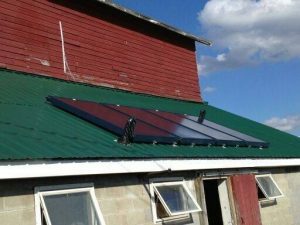 Wanting to offset the electrical consumption, the dairy farm’s owners hired Terry Moag from The Radiant Store, to install the system. The Radiant Store is a full service supplier of Solar Hot water systems in Northeastern, NY. Moag explains “SUNMAXX Solar is our supplier of choice.” Last month, the Solar Rating and Certification Corporation (SRCC), awarded SunMaxx Solar’s TitanPower ALDH29 flat plates the highest rated OG-100 Certification.